A pancake breakfast is a family tradition that we’ve always followed on weekends and holidays, whenever we’re not all scattering to school and work at different times. I’ve always thought that eating together and having a rousing conversation around a table was the perfect way to celebrate family, appreciate each other and have a good time. I have several “standard” pancake recipes. Normally I faithfully follow whatever Marian Cunningham (The Breakfast Book) says to do, but this particular recipe for ricotta pancakes evolved from several sources. The key is to separate the eggs, adding the yolks with the milk and fresh cheese and beating the whites and folding them in at the last minute. There’s a variation that is worth trying sometime. Add grated orange or lemon peel, and 1-2 teaspoons of juice to the liquid mixture. 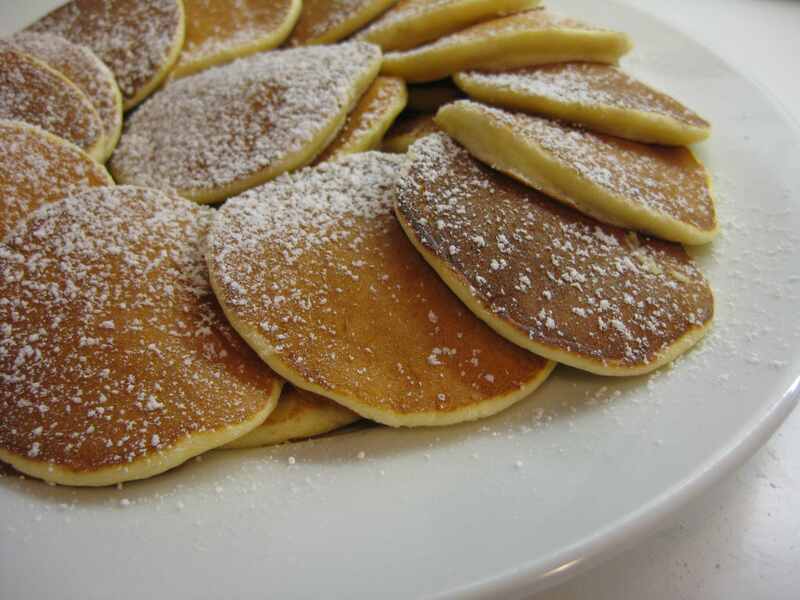 In this case, I would serve them with powdered sugar (or maybe orange or lemon curd) and not maple syrup. A few pancake-making tips… Make sure the ingredients are at room temperature. Drain the ricotta in a sieve set over a bowl for half an hour if it seems runny. Preheat the griddle over medium low heat for a good ten minutes. If the pancakes are very mottled (as the first batch is likely to be), your heat is too high and/or variable. You are aiming for even heat and uniformly colored surfaces, so you have to be patient about letting them cook thoroughly. Flip them when air bubbles rise to the surface and the bottoms are golden. If the ricotta cheese seems runny, drain it in a sieve set over a bowl for 20-30 minutes. Preheat the griddle over medium-low heat for 5-10 minutes while you are preparing the batter. With a hand mixer, beat the egg whites until stiff but not dry. Combine the milk, egg yolks and drained ricotta cheese in a mixing bowl, stirring to combine the ingredients well. (If you’re using the citrus, add it now.) Stir in the dry ingredients. Scoop a big spoonful of the egg whites into the batter and fold it in to lighten the mixture. Gently fold in the remaining egg whites. Melt a little butter on the griddle and towel off the excess. Drop the batter on the griddle leaving a couple of inches between each pancake. (The egg white keeps them from spreading much but these are delicate and spacing helps you flip them without incident.) Cook gently, adjusting the heat if necessary, and flip them after air bubbles rise to the surface and the bottoms are golden. Be patient. These take a few minutes per side. Makes about 24-30 pancakes about 2½ to 3 inches in diameter.